One summer afternoon, I was doing what I do best – enjoying some down time – when I heard the telltale buzzing of a hummingbird around my butterfly bush. Or was it? On closer inspection, I discovered that it wasn’t a hummingbird at all, but it sure looked like one! Meet the hummingbird moth, a moth so convincing that it’s named for the bird it mimics. It hovers and darts, it shimmers, it sips, it even hums! And its long, amazing proboscis unfurls like a garden hose to draw nectar from garden flowers. What a treat to get a visit from such an impressive moth! It’s very satisfying when birds, butterflies, and hummingbirds are attracted to my garden plants and feeders, and it’s even more special when a whole new species comes to say hello. I suppose I’m easily entertained, but a simple visit from a hummingbird moth or a rare bird can make my day! Hummingbird moths are members of the Sphinx moth family, a rather robust group of colorful (and huge!) moths. They grow up to 2 inches long and can easily be mistaken for hummingbirds, with their green and red markings and tufts of hairs that look an awful lot like feathers. Unlike many other species of moths that mostly fly at dusk, hummingbird moths are frequently seen feeding during the day, and they’re drawn to the same types of flowers as hummingbirds. Sphinx moths begin their larvae cycle as hornworms, which are large caterpillars with a hornlike part at their rear end. The bright-green hummingbird moth hornworm hatches from eggs attached to plants like honeysuckle, hawthorns, viburnum, and cherry. Then they munch around and make their way down toward the earth, where they form brown cocoons hidden underground and in piles of leaf litter. The adult moths emerge in spring and summer. In colder areas, there is only one generation per year, but warmer areas can support multiple life cycles in a year. 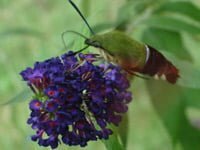 Hummingbird moth hornworms are generally pretty harmless to garden plants, unlike their cousins – tomato and tobacco hornworms – that can wreak havoc on crops. And the adults make great garden pollinators! All in all, if you have hummingbird moths in your garden, consider yourself lucky. I have hundreds of them, they have the yellow stripes on the lower abdomen. Could that many be harmful? I live too far north for hummingbirds, so I was delighted to find one of these moths in my garden! Even more so now that I know mine aren’t the variety to bother tomatoes. @ Vera: Nope! The are harmless and beneficial. If you have them it would be a good idea to check what kind you have. Also I’m not sure if the caterpillars will bite, or not. are they poison? do they bite are sting? I don’t like them. I like the humming birds just not the moth!